Anyone involved in the planning, creation, distribution, or measurement of content knows how time consuming and expensive it can be. It doesn’t make sense to simply publish something, promote it, and never look back. That’s a terrible way to get the most from your investment – not to mention that approach often results in a poor experience for your prospects and customers. Think about the last time you went to a website looking for answers, and instead of stumbling upon something current and helpful, you found ROT – redundant, out-of-date, and trivial content. Did you poke around to find better info or did you go someplace else? ROT occurs when you fail to plan what happens to your content after you hit publish and do the initial promotion. This one-and-done approach is costly to businesses – and, as your content library grows, it often makes the readers’ experience less than ideal. If you come from the tech world, think about how the product is managed over the course of its life. Product managers address multiple stages including planning, creation, launch, updates, and retirement. Content professionals need to do this as well. Where to begin? View content as a business asset – something that you need to manage strategically so you’ll get the best return on the content investment. The bad news? Few marketers have the processes and tools to make this a reality. 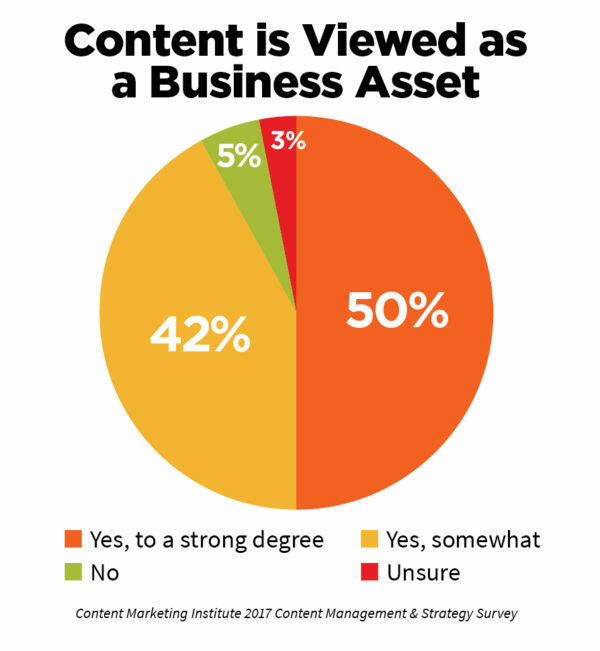 Let’s dig in to the results to see what is going on – and, more importantly, let’s pinpoint opportunities for marketers to truly manage their content as a business asset. 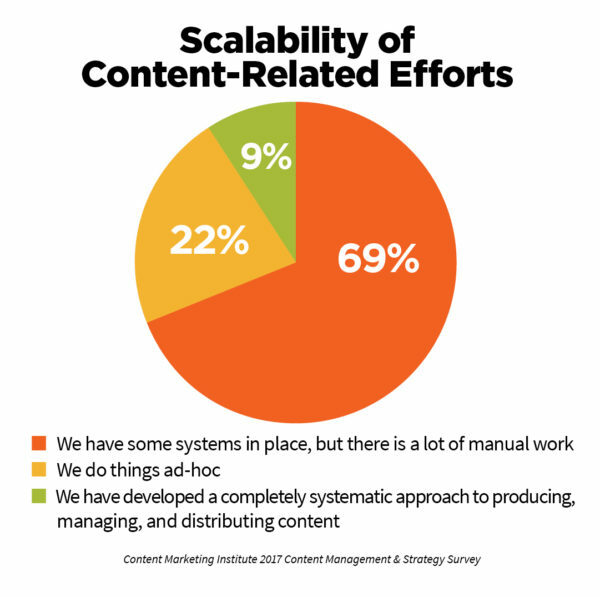 How scalable are marketers’ efforts, really? Marketers who manage their content as a business asset not only give their customers a better experience, but they also feel less stress because they have the systems and processes to create content in a scalable way. Repeatable processes are essential so you’re not spending time figuring out how to do the work and have time to do the work. Systems also help eliminate the intensive time needed to recraft every piece of content by hand. But, our research shows that only a small minority of marketers have the processes to be completely scalable. While this may seem like a bad thing, it’s a great opportunity for the marketers who figure it out. If you have the right processes, you are one step closer to creating better content, faster. 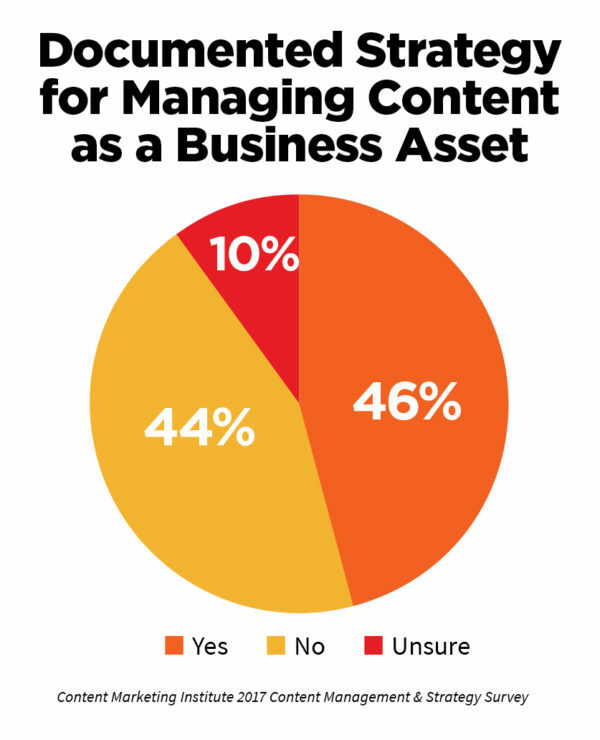 Document your strategy for managing content as an asset. Just as we talk about the importance of a content marketing strategy, it’s also essential to have a documented strategy for managing your content as a business asset. But only 46% of respondents have such a strategy. While no one-size-fits-all template exists for creating a content management strategy, the next section talks about some structures you may want to document. 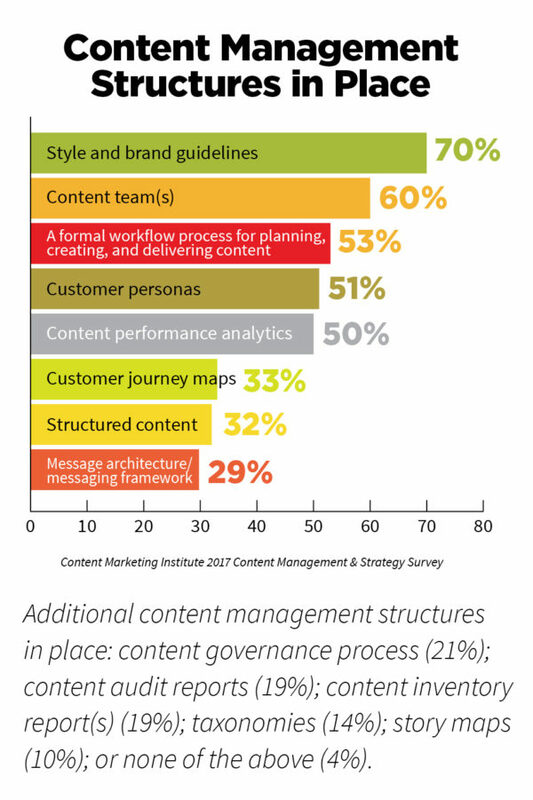 Marketers must have numerous structures to effectively manage content as an asset. However, according to our survey, less than half of respondents have many of these structures. Let’s look at each of these in order of how often they are currently used. Most marketers have style and brand guidelines. These are key so everyone on the team represents your brand in a consistent way. Sasha LaFerte offers lots of details and examples in her post, How to Write a Style Guide for Your Brand. People, process, and technology. These are the three essential things you need – in that order – to have an operational and scalable content marketing program. While so much can be said about a team, start with this post that looks at the 10 key roles. Once you have a team, you need to know who will do what. Rob Mills has a great post that outlines how to define your workflow, and Brian Watson’s post on how to find and conquer the bottlenecks in your workflow is a great follow-up. Of course, you need to know all about your customer if you are to make meaningful headway – and these personas need to be shared across the team. Ardath Albee has a wonderful process you can use to create personas – or you can learn more about iterative personas, which aren’t as formal. How do you know what content is working? There are so many ways to look at analytics, but every team needs to have a shared understanding of how success is measured. In a recent post, Mike Murray shared 101+ KPIs. You also can learn to use Google Analytics to uncover key insights about your content. As Marcia Riefer Johnston explains, customer journey maps answer the question, “What content shall we create?” If customer journey maps are a fuzzy concept to you, read Marcia’s breakdown of what customer journey maps are and how to create them. I think of structured content as blobs or chunks or content that can be used in multiple applications. They are the basis of the create once, publish everywhere strategy, but you can benefit from having these content chunks even if your process is not as formal. If you don’t know who on your team is responsible for which decisions or you want a better way to keep your content consistent and your processes efficient, you need digital governance. Here is an essential primer on the topic. You also can read how Intel has developed its digital governance program. I’m grouping content audit and inventory reports on purpose. The inventory report comes first, as it’s the list of all of your content, whereas the audit is an evaluation of that content. Paula Land provides a lot of explanation around these two concepts, and Cathy McKnight’s recent presentation at Intelligent Content Conference sheds a lot of light on audits. A taxonomy is essential for scalability because it organizes your content so related pieces can be surfaced. Blog post categories are an example of a simple taxonomy. Readers can click on a topic to see other posts that cover that same subject. Rachel Lovinger has some great ideas around the basics of taxonomies (and a close companion, metadata). Of course, not only do you need process, but you also need technology – the right technology. The good news is that technologies are available to make the labor-intensive processes go faster. 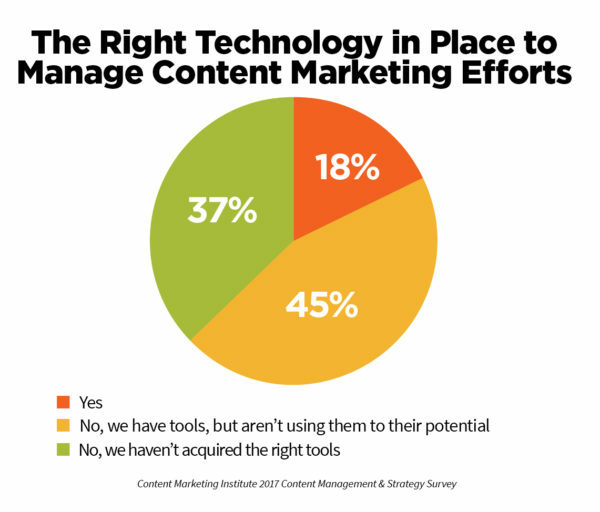 Yet, according to our research, only 18% of marketers think their organizations have the right technology to manage their content marketing efforts. Another 45% say their organization has technology but isn’t using it to its potential. This is another area where you have an opportunity to figure it out – and use in conjunction with a solid content marketing strategy – to leap ahead of the competition. As a reminder, before you jump into technology decisions, recognize that you need to have the right people and processes to implement and execute on the systems you choose. While the use of technology in content marketing is a massive topic, here is one article to get you started: 7 Ways Technology Can Make You a Smarter Content Marketer. 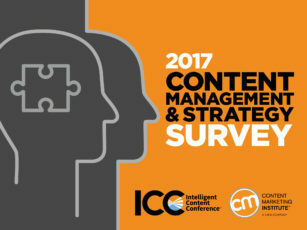 To see how your peers are approaching content management, read the entire report, Content Marketing Institute Content Management & Strategy Survey. Editor’s note: A special thanks to Lisa Murton Beets, CMI research director, who created this research and helped with this post. If you have expertise in this area, consider applying to speak at our upcoming Intelligent Content Conference. Call for speakers is now open until August 18, 2017.